The Trump administration's efforts to deport all the nasty horrible criming foreigners just keeps scoring wins! Along with all the undocumented moms and dads scooped up while dropping the kids off at school (total threats to the nation), the New Cruelty makes the occasional error, like targeting US citizens for deportation, which is quite the regrettable oopsie, but is really just the sort of thing that will happen from time to time. Isn't Making America Great Again worth a little overreach now and then? Still, troublemakers like the American Civil Liberties Union seem to think people have "rights," and now the ACLU is suing a county sheriff's office in Florida for having held a Philadelphia-born US citizen, Peter S. Brown, for three weeks while refusing to even check his repeated offers to prove his citizenship. After all, Immigration and Customs Enforcement had asked the Monroe County Sheriff''s Office to hold "Peter Brown" for deportation to Jamaica, and that was that. Serves the US-born Brown right for having such an exotic name. Back in April, Brown, who lives in Key West, turned himself in to the Monroe Sheriff's department on a parole violation because he'd tested positive for weed on a pee test. (See, already a dangerous criminal!) He expected he'd spent a few nights in jail at most, but instead, because Monroe County is one of 17 Florida sheriffs' departments that signed up to share information and hold immigration suspects for ICE, he ended up being mistaken for the wrong guy and scheduled for deportation, and nothing Brown could do would convince his jailers to even look at the proof he was a citizen -- although, as it turns out, the jail's own records listed Brown's place of birth as "Philadelphia, Pennsylvania." Serves him right for getting arrested by Sheriff Franz Kafka. Ha-ha, we are joking! The Monroe County Sheriff is named Richard A. Ramsay, and Sheriff Ramsay is named in an ACLU lawsuit accusing his office of "unlawful arrest and detention" of a citizen and violation of Brown's Fourth Amendment rights, as well as violation of Florida state law against false arrest. 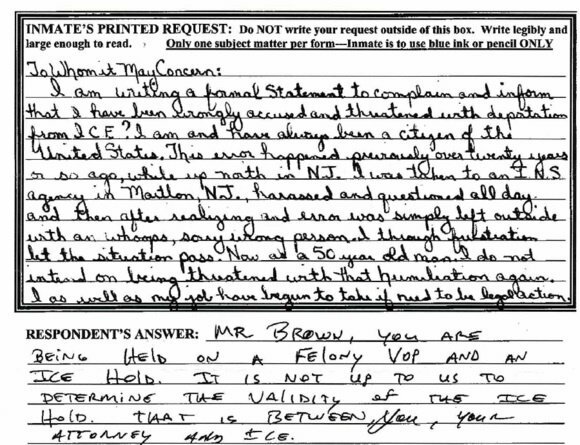 The lawsuit seeks damages for Brown's treatment, which included not only being falsely held for three weeks while the county ignored -- and jailers made fun of -- his attempts to show he's a citizen, but also taunting him about his certain deportation to a Jamaican prison. You know, just the sort of good-natured ribbing some good ol' Florida deputies would do to a gay man who feared being sent to one of the most homophobic countries in the Western Hemisphere. The ACLU also argues the nature of the "Basic Ordering Agreement" between ICE and county sheriffs includes a perverse incentive: Since ICE pays counties to hold people wanted on immigration warrants, the counties have every reason to disregard the rights of people who can't show they've been illegally detained. Needless to say, ICE portrays the BOA agreements a s a vital tool in protecting decent law-abiding Americans from criminal thugs who might be released on a technicality (like only being held until a minor parole violation is dealt with) then allowed back on the streets to terrorize us all with their driving without a license or smoking devil weed. [An] online inmate locator, viewed by Brown's friend, included eyebrow-raising information. By its account, Brown stood 7 feet tall, when in fact he is no more than 5-foot-7. It also listed an incorrect birthday. When his friend called the jail to say they had the wrong man, officers told her the only option was to inform ICE. Oh, but the jail staff didn't just ignore Brown's accurate claim he was a citizen -- they taunted him about it, because everyone knows the jails are full of innocent people. One sang the theme from "Fresh Prince of Bel-Air," because "In west Philadelphia born and raised..." is what passed for sharp wit to use at a stupid lying illegal Jamaican. For a variation, another member of the jail staff adopted a fake Jamaican accent and said, "Yeah, whatever mon, everything's gonna be alright." The complaint doesn't specify whether the jailer also sang like Bob Marley, but wouldn't that have been a hoot? Brown also filed a whole series of written complaints, including this one reproduced by the ACLU's blog post on the lawsuit. Hey, not our problem, said the sheriff's office. We're gonna hold you no matter whether the ICE request is valid or not, and the validity of your detention is "between you, your attorney, and ICE." Due process? We don't have to show you no stinking due process. Frankly, we're astonished that virtually none of the press coverage of Brown's case has made more of the fact that this is the second time he's been falsely accused of being a "criminal alien" -- he says over 20 years ago, in New Jersey, he was arrested by INS -- the predecessor to ICE -- then "harassed and questioned all day," then unceremoniously left outside with a "whoops, sorry, wrong person." Hey, man, everyone has a story. Enjoy prison in Jamaica and say hi to Jimmy Buffet if you see him, har har. Not surprisingly, even after the judge in his parole case ordered Brown's release, Monroe County refused to let him go. Instead, the sheriff's office rearrested him under the BOA, and held him for ICE, keeping the community safe from an American citizen. Brown told ICE agents that he was a U.S. citizen, and they agreed to look at his birth certificate. His roommate emailed the document to an officer, the complaint reports, at which point the agency "hastily arranged for his release." But wait! There was still time for one last bit of fuckery, according to the lawsuit: "Before he left, they confiscated all the documents they had given him regarding his impending deportation." Wouldn't want a paper trail documenting a tremendous screwup, heavens no. Brown is hardly the only U.S. citizen to face the threat of deportation. A Syracuse University study published in 2013 used ICE records to determine that the agency had placed detainers on 834 U.S. citizens over just a four-year period. In another detail that's gotten little attention, the ACLU's complaint even points out the Monroe County Sheriff's Office "recently held at least one other U.S. citizen for ICE" [our emphasis], but even after that incident, Sheriff Ramsay had "failed to implement any policies or training to ensure he has probable cause" when detaining people for ICE. Instead, the office's official policy is simply to hold everyone ICE asks to detain, no matter what. The lawsuit -- which names only Ramsey in his role as sheriff -- seeks a declaration that Brown's rights were violated, as well as unspecified damages and payment of his attorneys' fees. Yr Wonkette hopes The US District Court for the Southern District throws the book at 'em. And this book, too. Yr Wonkette is supported by reader donations. Please send us money! We're pretty sure you'll never be deported for THAT.